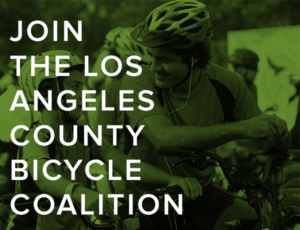 We’re still at 19 new or renewing members of the Los Angeles County Bicycle Coalition in the first-ever May BikinginLA LACBC Membership Drive after yesterday’s unplanned absence. So let’s get two more people to sign up or renew your membership now to make it 21 new members by the 21st. Your fellow bike riders are depending on you to add your support to the LA area’s leading voice for bicyclists, and help make this a more bikeable, livable and equitable city. Never mind the great LACBC gear you’ll get just for signing up. Happy Bike to Shop Day. Once again, the CHP gets it wrong. Despite what a CHP officer told the OC Register’s traffic columnist, there is no law in California requiring cyclists to ride single file, on narrow roads or anywhere else. Even though the department has been known to misapply CVC 21202, which requires bicyclists to ride as far to the right as practicable. 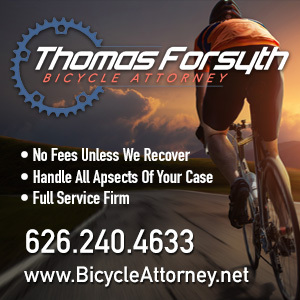 However, subsection 3 of the ride to right law exempts substandard lanes from that requirement, explicitly stating that the law does not apply on any lane that is too narrow for a bicycle to safely share with a motor vehicle. In most cases, that means any lane less than 14 feet wide, since bike riders are allowed to ride a safe distance from the curb, and drivers are required to give at least a three-foot passing distance. That means, despite the officer’s assertions, that there is no legal justification for ticketing cyclists who ride abreast in a narrow lane, and no requirement under California law that they ride single file in the scene shown in the photo accompanying the column, where the lane is clearly too narrow for a cyclist to safely share with most cars, let alone a truck or SUV. Yes, it is courteous to allow drivers to pass when safe to do so. However, it is often safer for bicyclists to ride side-by-side on narrow roadways — not so they can chat, but to increase visibility and prevent unsafe passing. As for whether it’s legal to cross a solid yellow line to pass a cyclist, that is allowed in most states with a three-foot or wider passing law. Unfortunately, Governor Brown vetoed an earlier version of California’s three-foot passing law that would have allowed drivers to briefly cross the center line to pass a cyclist, but only when safe to do so. It’s not the officer’s fault he doesn’t know the law in this case. The CHP has long failed to adequately train their officers in bike law, forcing officers to rely on cheat sheets that don’t list the many exceptions to CVC 21202, or go into detail on any of the other laws governing the rights and responsibilities of bike riders. But providing false information like that only puts bike riders at needless risk, and encourages driveway vigilantes to take out their frustrations on bicyclists who are riding safely and within their rights. Let alone subjecting them to tickets that aren’t legally justified, but are often too difficult to fight. Great opinion piece from Paul Thornton the LA Times, who says if LA really wants to encourage more bicycling, the city needs to fix the roads so they’re safe to ride. He also calls out former councilmember Tom LaBonge and current member Paul Koretz for dangerous decisions that defeat the purpose of the city’s Mobility Plan. The Eastsider examines the North Figueroa safety issues dogging CD1 Councilmember Gil Cedillo, as he claims to be working to improve safety, despite unilaterally cancelling a road diet designed to do exactly that. And they talk with Flying Pigeon LA bike shop owner Josef Bray-Ali, who has thrown his hat into the race to challenge Cedillo in next year’s city elections. Germany’s Andre Greipel wins his third sprint of the Giro d’Italia, then promptly quits the race. Andrey Amador takes the leader’s jersey from Bob Jungels after the 13th stage, becoming the first Costa Rican to lead a Grand Tour. Cycling Weekly examines five talking points about the Giro as the race reaches the legendary Dolomites this weekend. This has been one of the most democratic Amgen Tour of California’s in memory, as the race had yet another stage winner in Latvian pro Toms Skujins. Aussie Rohan Dennis won Friday’s time trial to leap into second place, 16 seconds behind leader Julian Alaphillppe. Meanwhile, American Megan Guarnier won the first stage of the women’s tour in a last minute breakaway. The AToC heads to Santa Rosa today, on the same day the city hosts their 122nd Rose Parade. Which is different from Pasadena’s Rose Parade. CiclaValley reacts to Thursday’s bicycling fatality in Panorama City, which occurred just hours after he returned from Wednesday’s Ride of Silence. LA’s Fox-11 concludes it is in fact possible to go carfree in SoCal. The newly opened Expo Line extension adds 130 bike racks and lockers at seven new stations. The LAPD has put out a BOLO Alert for a bike thief in the Central LA area. South LA Councilmember Joe Buscaino rode an ebike 25 miles to work at City Hall in observance of Bike to Work Day. KPCC is the latest media site to talk with the Eastside’s Ovarian Cycles Bicycle Brigade, who host their monthly women-identified Luna Ride tonight. A writer for the Daily Bruin tweets that the board of directors for Westwood Village has voted to spend $44,000 for two bikeshare hubs in the village this fall. Unfortunately, the lack of bike lanes means there won’t be any safe places to ride them. The Santa Monica Spoke invites you on a multi-modal Expo Line ride on Sunday. The LACBC talks with Antelope Valley cyclist and soap maker Sharon Murdock. It takes a world champion schmuck to steal an adult tricycle from a 67-year old Anaheim woman with multiple sclerosis. A Huntington Beach man gets seven years for beating a police officer who stopped him for an alcohol violation while riding his bike; the officer’s daughter was doing a ride along and witnessed the assault. Not that the sentence isn’t warranted, but why is it that motorists seldom get a fraction of that for actually killing a cyclist or a pedestrian? Potential San Diego bike commuters want more than just bike lanes to get them to ride, like showers and more considerate drivers. They have a much better chance of getting the showers. A Fresno cyclist says don’t count on laws to protect you from distracted drivers. Members of the bicycle industry finally bind together to promote bicycling in the US. Something should have been done decades ago — and with a much higher budget. HuffPo says we’ve been brainwashed into calling crashes accidents. Caught on video: A Seattle truck driver jumps the curb in an apparent attempt to run down a bike rider; the action starts after the 1:50 mark. Note to cyclists: when you’re posting video of drivers behaving badly, feel free to delete the extraneous footage leading up to it. A Salt Lake cyclist says he’ll be happy to pay for his fair share of the roads, as long as drivers pay theirs. Agenda 21 is just so passé; evidently the new global bad guys are AARP and the World Health Organization, forcing age-friendly complete streets down the throats of those fine, upstanding Vermonters. Apparently, traffic violations that put bike riders at risk don’t violate the rules of New York’s Taxi and Limousine Commission. A DC bike commuter lists his pet peeves about riding to work, from cars that don’t signal to the traditional catcall to get on the sidewalk. A bicycling Florida non-profit is redefining sharecropping, riding en masse to work organic gardens on land borrowed from homeowners; the model has already spread to Oakland and Uganda. Brazil’s bike-riding president is running out of options to fight her ouster by impeachment. A Toronto bike lane carries nearly as much bicycle traffic as the roadway next to it does cars. Nothing like just now returning one of London’s Boris Bikes late after it was rented on New Years Day — in 2015. London’s Telegraph asks if an increase in heavy truck traffic in the UK is responsible for an unexpected decrease in bike ridership. Not bloody likely, to use the vernacular. More spending on bicycling would show Britain is serious about increasing ridership. Two Afghan cyclists on a round the world journey stop in New York to tell UN Secretary-General Ban Ki-moon their country is tired of war and violence, before setting out across the US for Los Angeles. An Aussie writer asks motorists to remember the driver who killed his 75-year old bike-riding uncle, showing rare understanding and sympathy for the inevitable impact it had on the man responsible. Forget self-driving cars; the next thing is Google’s interactive Levi bike jacket. Nothing like putting a billboard in the middle of a bike lane. And the next time you’re in San Diego, a bronzed Bill Walton and his bike will be waiting to greet you on the shores of Mission Bay. Good explanation of CVC 21202(a)(3) and the cluelessness of the CHP in general regarding that section. More people need to learn this. Hopefully a lot of people read what you wrote and understood it. I dunno…I tend to disagree with the whole double-file riding arguments. First, whenever I hear the “not explicitly outlawed,” that means the person is trying to get away with something. There’s no “explicit law” that says I can’t mount a multi-megawatt laser on my car. But I’m sure that some law can be interpreted to keep me from doing it. So the argument that if the road is too narrow for a bicycle and a car to co-exist, all rules about riding as far to the right as practicable are off and you can do whatever you want–which may be the legal interpretation of the law–is certainly not the intent. You should still ride as far to the right as practicable. It may be, though, that that position happens to be in the middle of the lane. Second, I might also argue that by splitting the road, you’re actually in more danger. If there’s something in the road, you less room to maneuver left and right. Also–and I’m joking here–by riding single file, I have someone behind me who’ll get hit before I do. It’s like the old saw about the bear: I don’t have to ride faster than the car, I just have to ride faster than you! Third, even if I were to agree that, in this environment, it’s okay to ride two-abreast, I’ve seen cyclists riding two-abreast with one of them in the bike lane. You can’t really let that one go with “there isn’t room for a car to pass.” I’d tend to go with the idea that it’s better to ride single-file because if the conditions change in the roadway and you’re now in a situation where it isn’t legal under subsection 3 or you have a situation where you can safely pull to side of the road to let cars pass, it’s easier to do it if you’re riding single-file. As the CHP officer in the article said, the rider on the left (and I would argue both of them) are rude and possibly doing something illegal. Actually, while the law may not mention lasers specifically, there are numerous laws governing weapons, as well as motor vehicle, which already prohibit that. But for your argument about things not specifically banned to be valid, you’d have to throw about about 500 years of English Common Law, which forms the basis of the American judicial system. One of the key tenets of which is that anything that isn’t specifically prohibited is legal. And nowhere in the California Vehicle Code is riding abreast even mentioned, let alone banned. Therefore, it is legal. You unintentionally touch on the correct argument when you say that riding as far to the right as practical may be in the center of the lane. Consider the placement of sharrows. They are correctly used only on non-sharable (substandard) lanes, and are generally placed in the center of the lane to show proper lane positioning. Which means that NACTO, ASHTO, the Federal government and Caltrans agree that the center of the lane the ideal positioning for cyclists on narrow traffic lanes. The League of American Bicyclists Licensed Cycling Instructor program, and the Cycling Savvy program agree as well. As for my interpretation of the law as explained above, it’s not my opinion. Everything I said above is how the law is defined by the LAPD, in consultation with the LA City Attorney’s office. 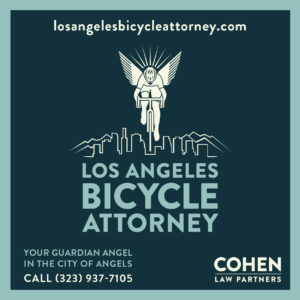 You can learn more about how they interpret bike law by viewing the LAPD bicycle training module that was required viewing for every street level officer when it was prepared five years ago. Of course, what you’re comfortable with, what you consider courteous and where you prefer to ride is up to you. @Peter: I find it amusing that you think that you know the intent of the law. Actually, it’s laughable. Maybe I should ask Bob Shanteau, who wrote CVC 21202(a)(3) in 1975 and lobbied to get it added to the law (which it was starting in 1976), to respond to your comment. Bob agrees with us, or more accurately, we agree with him, since he got this into law before Ted or I had any concept of using lane control for safety in narrow lanes. The law clearly says: “except under any of the following situations” which means that if any conditions satisfy any of those exceptions, then indeed, the requirement to ride far right is out the window. That’s what those words mean. You’re reaching very, VERY hard to keep cyclists on the edge. Riding side by side does in fact make cyclists more visually conspicuous from a greater distance which means more reaction time which means safer every time. Using the full lane makes it clear that you can’t just squeeze by. I rode on the edge all the time from 1971 until 2008, when I first started learning bike safety. The difference in average passing distance between edge riding and full lane use is probably about 4-5 extra feet, which sure feels a lot safer to me. Your ignorance betrays you. 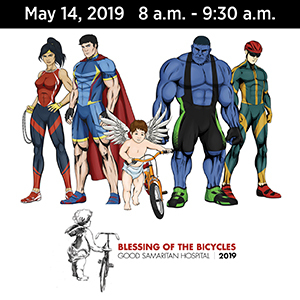 Worse, your prejudice causes you to deny the words that the law plainly say and deny advice of top bike safety education sources such as Cycling Savvy, the League of American Bicyclists and several others. You have no idea what you are talking about. There is nothing rude about assuring one’s own safety or exercising one’s basic rights. I suppose you think that Rosa Parks was rude for not giving up her seat on the bus.